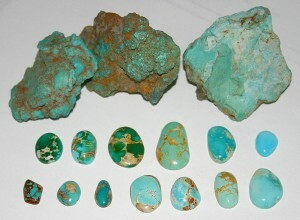 Turquoise properties vary depending on where the mineral was formed. The varieties best known in the United States are predominantly mined in the Southwest, in locations with a higher copper content. The primary turquoise properties are copper, aluminum and phosphorus, although in rare circumstances other elements have been known to replace aluminum in the formation of turquoise. For instance, iron or zinc may replace aluminum to form turquoise stones with different coloring. Those who collect these gemstones are largely interested in the mines where the stones formed because of the distinct characteristics and turquoise properties that are created under different conditions. Some collectors prize stones from the Emerald Valley mine for the distinct green color with complex veining and matrix formation. The Sleeping Beauty Mine is well known for more pure turquoise properties. The finest stones from this mine are sky blue in color with little or no detectable veining. This blue turquoise jewelry is some of the most sought after on the market today. Turquoise is most prominently discovered in areas where there is a high concentration of copper. This element is the most important in understanding how the gemstone gets its vibrant blue color. Geologists believe turquoise properties are formed by acidic solutions of other minerals, which percolate due to weathering and erosion. Climate plays a role in the erosion of parent materials and the stone is usually formed in arid climates. Turquoise properties and location have played the biggest roles in determining the value of stones. A good example would be stones pulled from many mines in Arizona. The elements are just right to form turquoise properties that are considered highly valuable to collectors. Stones from depleted turquoise mines are among the most popular on the market and are becoming increasingly hard to find, although there are still stones from depleted mines available through vendors as well as collectors.